What is a Colle's Fracture? Colle's Fracture refers to the fracture of the distal radius accompanied by posterior dislocation of the distal fragment. The fracture usually originates from falling with an outstreched hand. The deformity on the hand is obvious and many people refer to it as a broke wrist though the fracture is to the radial bone. Colle's Fractures were first described by Abraham Colles before evention of X-rays. These fractures are common among youths and the elderly. There is a strong relationship between Colle's fractures and osteoporosis in the elderly. Therefore it is imperative to check for osteoporosis in the elderly presenting with Colle's fracture. In the youths, these fractures are usually associated with high impact sporting activities. 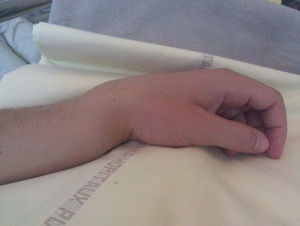 In a patient presenting with a Colle's fracture, the hand resembles a dinner fork hence the term dinner fork deformity. All finger and hand muscles, joints proximal as well as distal to the fractured site must be included in every rehabilitation programme.